Happy Sunday! We’ve rounded up our top three favorite sales that are currently going on for you. To make things easier for you, each store name is linked so when you click it, you’ll be taken directly to the homepage. We’re also sharing with you our top picks from each sale. All of the our top picks are either items that we have already bought or that are on our wish list. If you click an image in the top picks sections, you’ll be taken directly to that item. Happy shopping! The mild fall weather is continuing in the Midwest! I’m trying to enjoy it and soak it up as much as I can because I know soon enough the long, cold winter will start. With the mild weather, I’ve been wearing dresses to work a lot. The thing I like about dresses is that you look really put together, yet picking out a dress is way easier than a whole outfit. This purple dress is another new one I got this summer for fall. It’s so comfortable, which makes me wish I would’ve gotten it in more colors. 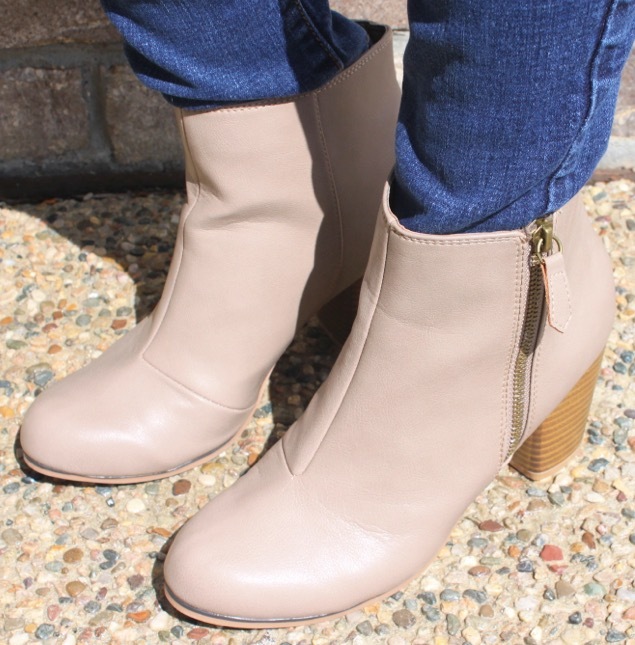 I think this purple color is perfect for fall and the black booties gave it even more of a fall look. 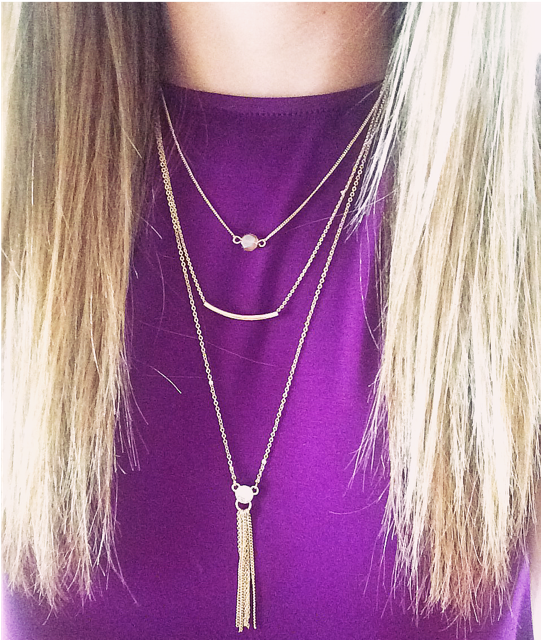 I just got this layered necklace last weekend and love it! I thought it was the perfect necklace to go with this dress! Yesterday was another cold day, we just can’t seem to catch a break with the weather around here. Even though it was a little colder I didn’t want to have to wear a coat so I decided to wear my J. Crew sweater paired with my J. 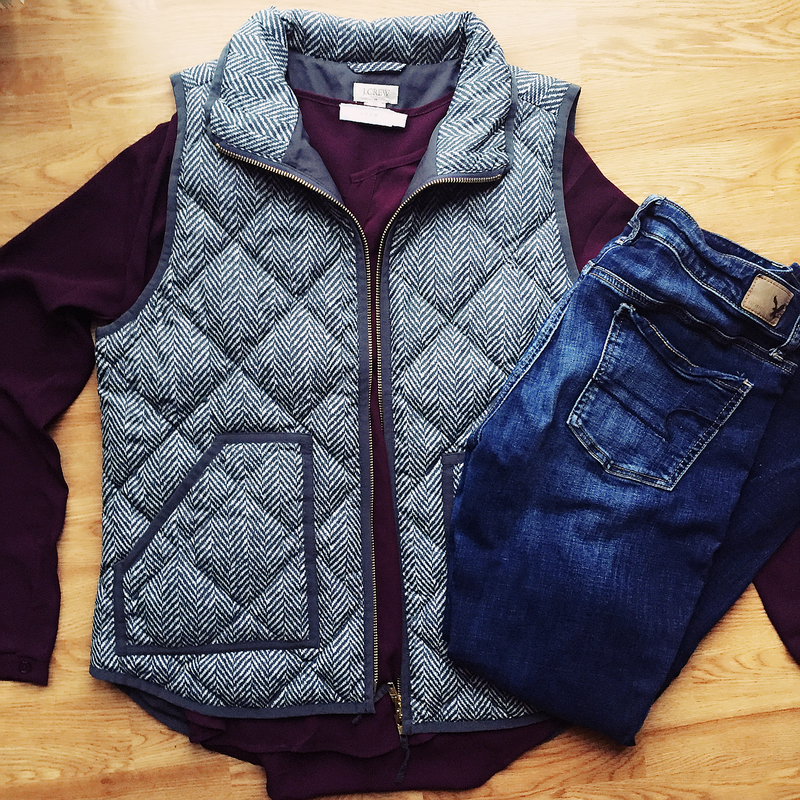 Crew vest. For accessories I went with one of my J. Crew statement necklaces and my Tory Burch Fitbit bracelet. I wore my Sperry flats which are one of my favorite flats! I went with my Rebecca Minkoff purse because I had to take my dad’s truck in to get fixed and wanted to take my IPad with me to work on blog stuff. 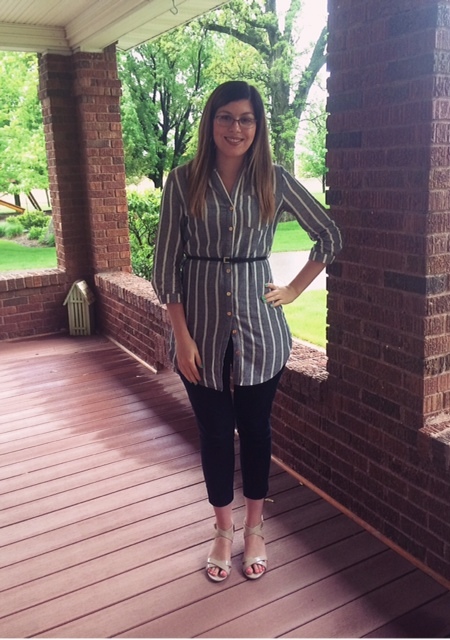 First off, I can’t wait until I’m done with work for summer so I can start showing you some more fun outfits instead of my work clothes (11 more school days)! Like Rachel said, it was chillier yesterday. I decided to go with one of my favorite cozy sweaters from Express that has a hi-low hemline with some fun zipper details. For pants I went with my favorite black jeggings that I love to wear to work. For accessories I kept it simple with my gold monogram necklace and some simple gold earrings. I completed the look with my black Target sandals since it is spring! I wanted an outfit for today that was dressy enough for going out for supper yet not too much for going to a movie. 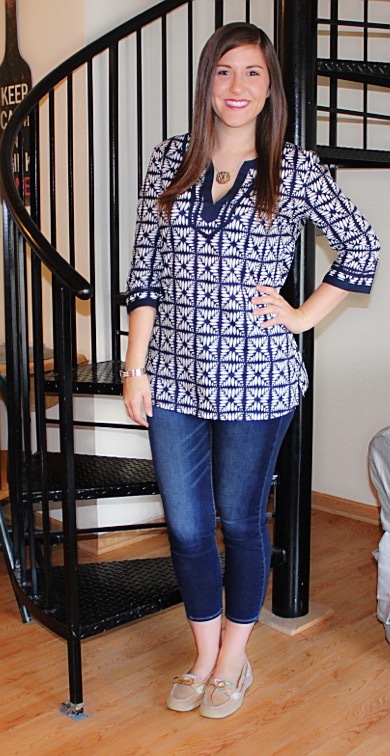 I decided on my white chambray tunic from J. 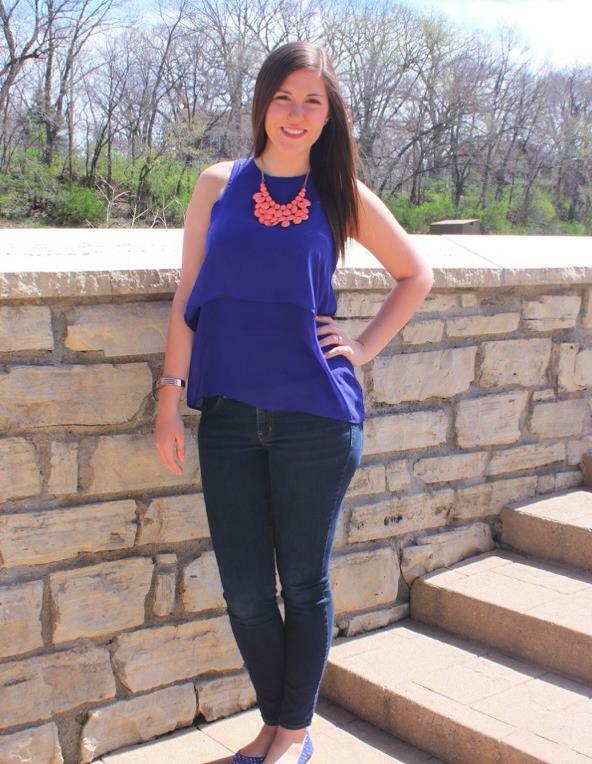 Crew paired with a statement necklace and jeggings. I also added my royal blue Steve Madden flats to add some color to the look. I thought this was simple enough for the movies yet still had a little pop to make it nice enough for going out to eat. Like Rachel, I also wanted an outfit that was comfortable yet dressy for going to a movie and out to eat. It was another chilly Tuesday, so I decided to wear a lightweight sweater. The short sleeve top I’m wearing is so comfortable that I have it in two other colors. I really like that it’s a longer length as well. 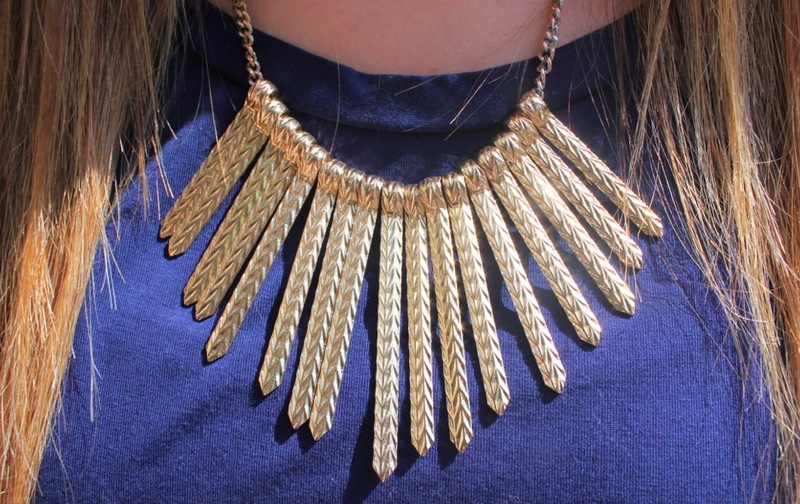 I, of course, finished off my look with one of my favorite statement necklace and a pair of booties. 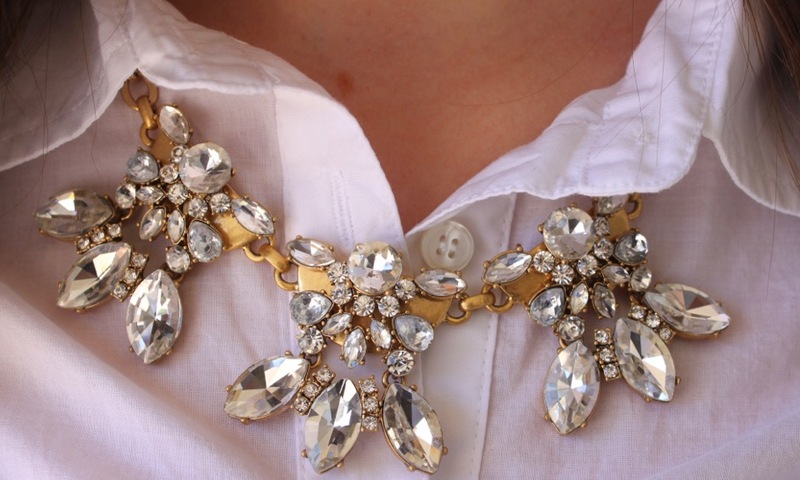 For my outfit I wanted to style my new Sparkle Box necklace! I love how coral looks with royal blue so I decided to pair it with one of my favorite Ivy & Leo tank tops, along with my Steve Madden flats. 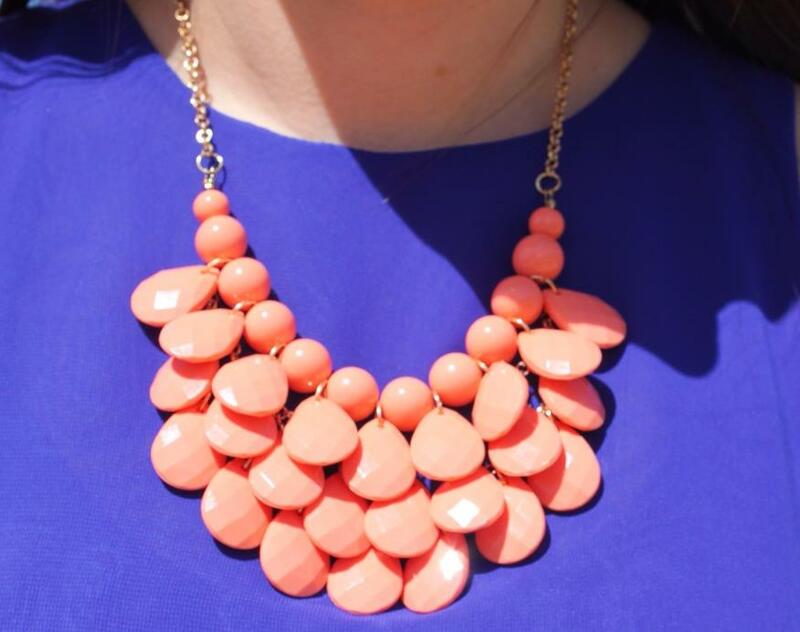 If you haven’t heard about Sparkle Box yet it’s stylish jewelry delivered right to your door! It’s a monthly subscription box and for $19 you get 2-3 pieces of jewelry in the style of your choice. The different styles are boho, trendy, subtle, avant garde, quirky, & Sparkle Girl. My necklace is the trendy style. I love that Sparkle Box always reads customer comments and that they do their best to match preferences so I always get something I love! Interested in signing up for Sparkle Box? Use the code: 2CLASSYSISTERS to get 10% off your first box! You can also enter our giveaway below for a chance to win a Single Sparkle Box in Selected Style! Author 2classysistersPosted on May 7, 2015 May 6, 2015 Categories STYLETags accessories, American Eagle, chic, classy, contest, enter to win, fashion, freebies, giveaway, jewelry, steve madden, style5 Comments on OOTD + Sparklebox GIVEAWAY!